One of my goals for 2009 was to find "proper" gallery representation.....a serious retail location specializing in fine art crafts with at least a few years in business, a knowledgeable staff, noticeable advertisements, and an up-to-date website. After a careful Internet exploration, I targeted the Grovewood Gallery and submitted my application by the March 26th deadline for artist consideration. (Submissions are reviewed twice a year.) Unfortunately, I received a rejection letter.....the absolutely nicest one I've ever read. It was very encouraging and actually rather "open ended" too. Well, I later submitted to Blue Spiral 1 and wasn't the least bit surprised to receive a form letter rejection. Yet, they also enclosed a flier for Asheville's "First Friday" gallery crawl. I went. I found another gallery that looked promising. I introduced myself to the owner. I sent my materials....and the response was....well...."interesting". Something wasn't "quite right". I don't know what prompted me to call the Grovewood Gallery, but I did. They invited me to mail two small pieces. I did. They liked them. They mentioned introducing my work right before Christmas. The two pieces weren't hung....but were within the public's eyesight. They generated interest....enough attention that the gallery decided to introduce my work even earlier! I got this exciting telephone call only a half hour before my departure for Europe. While I was gone, Steve had to attend to this important matter. By the time I got home....I had the representation I most wanted! I'm now an exhibiting artist at the Grovewood Gallery! Steve blogged about his trip to Asheville to deliver my work HERE....more photos too! I am now working on the photos and blog entries for my trip to Sara Lechner's in Austria! Several months ago I was honored with an interview by the incredible British fiber artist and author Maggie Grey. It recently appeared in the September issue of Workshop on the Web. This is an incredible Internet subscription. The free "taster" is here. Maggie said I could post this interview. This will be my last entry for approximately two weeks as I'm going with Annica and some other Swedish embroidery friends to take a workshop under Sara Lechner in Austria! I leave tomorrow! (Maggie) I think everyone who was involved in the CYBER FYBER exhibition (more on that later) stands in awe of Susan Lenz. Her amazing vision in bringing this international exhibition together resulted in one of the most talked about textile events ever. With the swaps of Artists' Trading Cards (ATCs) and Postcards, Susan succeeded in bringing a sense of global involvement that went beyond the internet community and brought textiles to the fore. I’m honoured to have the chance to ask some personal questions and find out what’s been happening to Susan since the exhibition. (Maggie) First things first - in all the words that have been written about you, I haven’t found out how you got started in textiles. Did you have formal training or a childhood interest - I’d love to know. I didn't learn to stitch while a Girl Scout or from my grandmother, though both tried on at least one, horrible occasion. 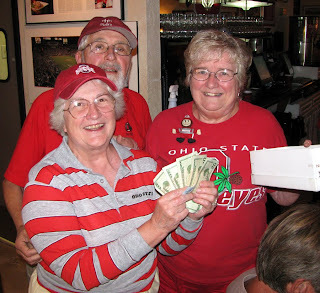 While my husband Steve was in graduate school finishing his PhD in civil engineering at Ohio State, we'd go annually to the Ohio State Fair and browse through the 'arts and crafts' building, looking at all the pies, cakes, canned goods, and handmade items – like needlework. I'd look at these pieces and remark, 'I could do that' . . . and . . . 'I could make this', etc. Steve would always reply, 'Put your money where your mouth is!' One year, I found a State Fair entry book; it was complicated; it didn't even know what most of the categories were, but one said 'Pillowcase'. I made a pillowcase. I had no idea what I was doing. I had some embroidery floss from a yard sale and a white pillowcase and a needle - yet I won a blue ribbon. That was nice, but the important thing that happened was going to the fair that year and seeing what all these mysterious categories really were. With fresh eyes, I looked and decided I would spend the coming year learning as many techniques as I could. 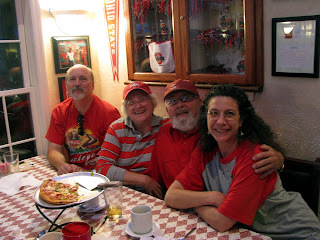 Of course, as a poor graduate school couple, we had no money. I checked out (repeatedly) the Reader's Digest Complete Guide to Needlework from the library. My only 'supplier' was Frank's Nursery and Crafts, basically a local version of a 5 and 10-cent store. During the year I did as many 'categories' as I could figure out. Some I hated. Some I liked. I only did one of each though. Near the end of the year, however, I saw a newspaper article about a needlework show (one little room) at the Senior Citizen building. I went. It was awesome. I met the embroiderer who introduced me to the local chapter of the Embroiderers' Guild of America (EGA). In 1996 the seminar was in New Orleans. I ended up in a class called Autobiography in Stitches under Charlotte Miller. I didn’t realize that it was a 'design' class. Frankly, I’d never 'designed' anything but Charlotte gently told me to 'arrange my elements'. I would never have attempted to 'design' anything but I have no problem 'arranging elements'. I completed three rather large pieces that week. Charlotte was the perfect teacher to guide me toward my own creativity. Bernina supplied the classroom with a 'demo' machine, a 1630, which was then available at a discounted price. Though I’d never really used a sewing machine, I bought it. 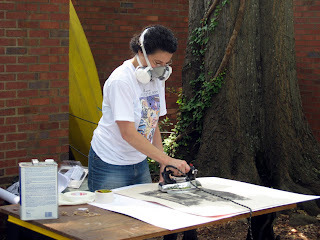 (Two years later, I took my first book arts class under Charlotte . . . another very influential experience.) 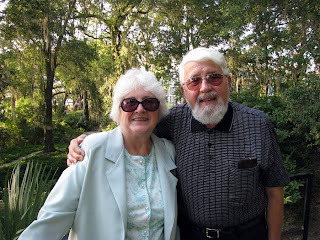 Jan Beaney and Jean Littlejohn were also teaching in 1996 in New Orleans. They were the rage of the seminar and I knew, from the moment I saw their work, that this was my future and artistic passion. I vowed never to do another pattern or kit. I've never looked back. With the notable exception of Charlotte Miller, all my most influential workshops have been under British tutors. In fact, I really didn’t use that Bernina 1630 until an opportunity to go to Louisville, Kentucky for a workshop with Valerie Campbell-Harding. I learned from 'the best'. I finally got into a class with Jean Littlejohn in 1998. Juggling a growing business and a passion for embroidery was nearly impossible though. I really didn’t get to stitch except during my one week a year. By 2000 I had to admit to myself that I really 'wanted to be an artist when I grew up'. I knew my media was going to be fibres, embroidery in particular. In July of 2001 I turned my world upside down. I started the forcible downsizing of Mouse House and got my studio at Gallery 80808 in order to pursue this dream. My first 'art' was created in my current studio and really, nothing much dates to years in the twentieth century. I'm part of the twenty-first century and the Internet is definitely part of the journey. (Maggie) In your artist’s statement, you say 'During the first half of my life I tried to find answers to the big questions - am I good enough as a wife, a mother, a daughter, a friend, an employer, a businesswoman, a citizen? Have I done enough work, given enough service, pleased enough people? Have I acquired enough respect or money or knowledge? Do I have enough faith? For the next half, I’m looking inward, exploring myself. With thread and through stitches’. How’s that search going? There are so many times I’ve thought that I’ve outgrown this statement. Then something negative happens and I’m right back questioning my own worth, full of doubt, wondering whether I’m good enough. The best way to overcome these feelings is stitching. The physical act of pulling thread through fabric is soothing, meditative and full of positive energy. I’ve learned to use stitch to express my social and emotional concerns. This is a positive outlet. Most of my doubts stem from the fact that I don’t have a 'proper', academic background in art and in fibres. Little by little, I’m learning that a degree doesn’t define one’s quality. Looking inward, exploring oneself, expressing those discoveries with attention to craftsmanship and concept does determine quality. That’s exactly what I strive to do and I didn’t need a degree to do it. 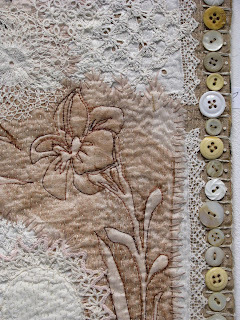 By stitching a good piece, I still find satisfaction and the fulfillment of 'enough'. My artist’s statement ends with this sentence, 'I search now for personal and spiritual truths, generally finding that ‘enough’ is always with me so long as I keep chasing it'. Well, I’m still chasing, probably always will be. (Maggie) It seems to me that all the work that you do has a deep meaning. Can you talk us through some of the series pieces that obviously mean so much to you. Concept is very important to me. I work in series because doing so provides so many ways to explore a concept. I’ve been in workshops with tutors who have advised against 'making a fourth piece', feeling that three in a series is sufficient. I don’t agree even though I understand this advice. The first two or three pieces generally have the strong impact of a new, brilliant idea. The next few seem to be variations on a theme, lacking the intensity of the earlier work. Yet, working through this period has brought about a fresh approach and a broader understanding of one's own concept. The best work is almost always later in a series, once the concept is so natural that it feels like breathing. At that point, the work comes easily. To explain this, let me tell you about Blues Chapel. Blues Chapel began in 2006. 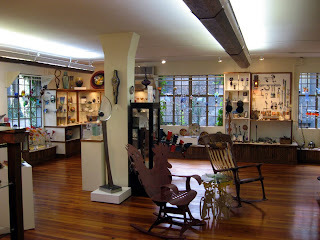 My studio is located in a co-operative setting of thirteen rental spaces at Gallery 80808/Vista Studios, 808 Lady Street. The thirteen artists exhibit together twice a year for annual gallery crawls: Vista Lights in the autumn and Artista Vista in the spring. We frequently select a title for our group shows. That spring the title was 'Blues on Lady Street'. All the other artists focused on the colour blue or totally ignored the title. I, however, decided to do a little research on female blues singers. I had no earlier knowledge or interest in the field until this time. The research totally stunned me. Reading about these women was depressing. Listening to their songs was exhilarating. It was obvious that these early singers paved the way for today’s young, African- American, female superstars. I went to work creating twenty-four portraits of early Blues singers, depicting them with gilded halos as if martyred saints. Believe it or not, there are no stitches in these framed works. Hung touching one another in a formation that mimics a block quilt, these are mixed media creations that include reverse glass painting, acrylic photo transfers, and found objects. 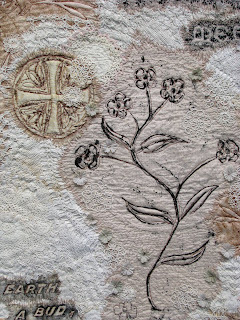 During the process, I learned that I approach art as an embroiderer no matter what I am doing. While gluing on beads, buttons, scraps of millinery net and artificial flowers as well as applying dabs of paint and touches of metallic foil, I realized that I planned everything as if it were a stitch. Beads were positioned as if French knots. Strokes of paint were straight stitches. I also learned that I wanted to control how my work is viewed. It became an installation before I knew that was the right word to describe it. Old theatre curtains were acquired and hung. A music stand surrounded by hundreds of votive candles was added. Music filled the air. This initial work was strong and successful. It still has the impact that comes from being a 'starting point'. The executive director of the Sumter Museum of Art saw the work and invited me to display it later than summer. 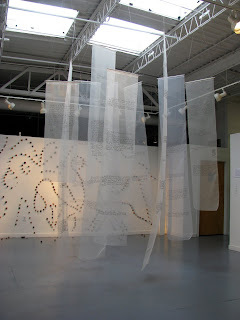 So, what does this have to do with embroidery, working in a series, and expanding a concept? Well, the Sumter Museum of Art is an enormous space. I had to both create new work for this opportunity and supplement with other work. This meant I had to really explore my concept….the Blues, a sacred setting, and the perseverance of women in the face of overwhelming odds. I had to build the church, not just recreate a chapel. This required me to think about architecture, another favourite theme in my embroidery. Four very large “stained glass” pieces were made. These were part of my 'In Box' series of polyester velvets on acrylic felt, painted Wonder Under (Bondaweb), free motion machine embroidery using 100% cotton thread, and melting with a soldering iron and heat gun. (This process is the only tutorial I’ve ever written.) I used a familiar technique perfected in another series of work to express the concept of sacred space. I also supplemented the exhibition with another series called Elements in Architecture. I selected them because so many were based on Gothic and Romanesque buildings suggesting parts of churches. Blues Chapel in Sumter was very successful but I knew it could have been better. The new and supplemented fibre pieces 'worked' but were really just the second step in the process. 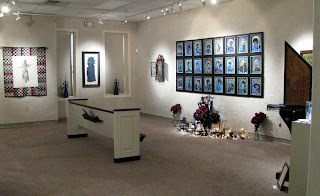 Fortunately, Blues Chapel was picked up by the Pickens County Museum and the Discovery Center in Edgefield, South Carolina for a total of four months during the summer of 2008. The intervening time allowed me to really explore my concept in depth and express it in stitch. I returned to my Elements in Architecture series - with a twist. My intentions were stronger and more focused. Instead of just interesting colours, shapes, and textures based on buildings, the new work was impacted by the concept of the Blues. Icons, symbols, and a mix of African-American themes with religious overtones became the Elements in Blue Series. I can honestly say that this series is more powerful and significant than the earlier series from which it came. While working on these pieces, I wondered about size. Would larger works have more impact? 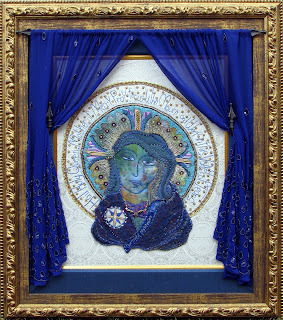 I created Madonna of the Blues and Taking Flight. I also wondered about the plight of these Blues singers. 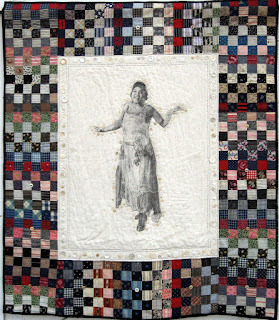 Bessie’s Quilt and Ma Rainey, A Domestic were then stitched. All these works have meaning because they were conceived as part of a larger body of work. I find it easier to develop successful works while revolving around a strong concept - and sticking to the theme until it is completely part of me. Of course Blues Chapel isn’t my only installation. I created the Archaeology Project in the fall of 2006. Like many of my installations, it can be rearranged into smaller groupings or have parts used in other installations. The Collector was accepted into Craftform 2007, a national juried show. Wrapped Spools and Wrapped Carriage Bolts have been in other juried shows. I’ve sold some of the artist books too. In truth, all these were 'parts' of the Archaeology Project. I also continue to add to it – an excellent way to recycle small experiments and turn UFOs into worthwhile tidbits. Toward the end of 2007 I started another installation, Decisions. 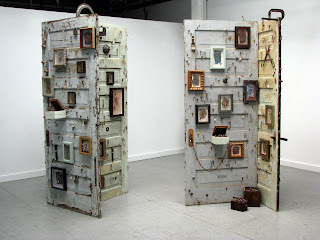 I started with four, old solid wood doors covered in peeling paint and hundreds of keys. Some keys are framed with embellished and stitched backgrounds. Others are tagged with collaged vintage letters on zigzagged cords. I’ve sold some, replaced them, and exhibited a few individually. Even before I’d finished the doors I knew I wanted to make 2-D embroideries, to expand the concept of 'decisions'. From this idea came my Decision Portrait Series. The keys, doors, and portraits are meant to be shown together as an exhibition called Personal Grounds. The statement is really simple: “'Personal Grounds' is a location in life. It is the place in which one exists as a result of doors opened, keys turned, and options exercised.” Everything has been created around the concept and exploration of decisions. Recently, I started submitting for solo show opportunities. In the meantime, I’m deeply involved with the portraits. I have a blog explaining the series, documenting the work, and being used as a tool to find individuals willing to share a life altering decision as a “model” in the series. This has been an adventure, a collaboration with others to show more than a physical portrait but a life story. 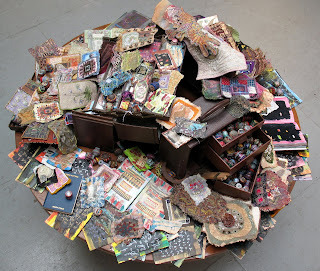 Like my other installations, some of the pieces have enjoyed individual attention. Behind in the Mortgage earned a top award at Materials Hard and Soft, a national juried fine craft exhibition in Denton, Texas. Because I work on several pieces at once, including ones from different series, I find that one series often influences another. Last year I made Crazy, or Mamie’s Quilt. Mamie Smith was the first female Blues singer to record a song. The title was Crazy. 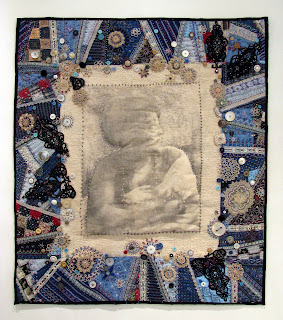 Why I didn’t think of a crazy quilt years ago, I’ll never know; but it is obviously part of the Blues Chapel series though started after the last exhibition ended. Yet, it is a xylene photo transfer like the Decision Portrait Series and it led to a love affair with kantha inspired running stitch. 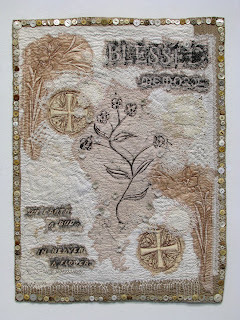 This meditative stitching became an important part of my newest series, Grave Rubbing Quilts. 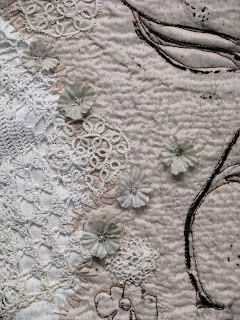 I really find that embroidery is the perfect way to explore these various interests and the connections between them. machine pieced 'crazy' quilt. Heavily hand stitched and beaded. 36" x 32" (91 x 81 cm). 2008. Click on image to enlarge. 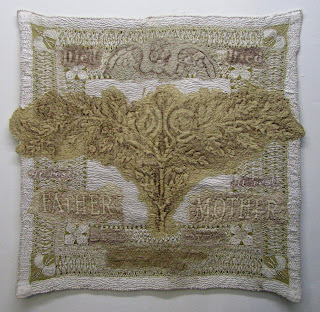 Below: Father and Mother, Grave Rubbing Quilt Series. 2009. 30" x 29" ( 76 x 74 cm). (Maggie)Turning to CYBER FYBER - how on earth did you get the idea and what was the biggest thrill that it gave you? The idea for this exhibition isn't entirely mine. It started with a conversation in my studio. Janet Kozachek, a mosaic artist from Orangeburg, suggested a show of artists that blog. The idea was a great start but too large for a single show. I asked her how she planned to focus such an exhibit. She wanted 'good writers'. That sounded funny to me. Too many of my favourite blogs are written in the author's second language, with help of an on-line translator that doesn't quite get all the words and doesn't understand all the grammar - but the content is still outstanding . . .and there are blogrings for writers. I said something like, 'Janet, if I were you, I'd focus on either South Carolina artists who blog or mosaic artists that blog'. To the best of my knowledge, nothing ever developed after this conversation other than a seed sprouting in the back of my mind. 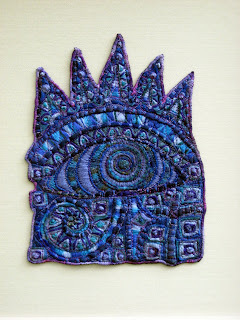 I kept hearing that seed's voice, 'What about fibre artists that blog?' By January, I knew I was going to take the idea forward. I knew I wanted an exhibit to show people how access to the Internet changed my art; created my supportive, global community; and how fun it all is. I'd opened 'Pandora's Box' - I was going to show the magically things inside. CYBER FYBER was about to be born. The biggest thrill was learning that people really would trade with me. Until CYBER FYBER, I’d never traded. I made my first eight postcards as surprise Christmas gifts the month before. With the help of Doreen Grey, my cyber buddy who later became the proof-reader for each and every page of the interconnected blogs that make up CYBER FYBER, I got the physical addresses for these eight bloggers. Then I made my next postcards - all 163 for Round One of CYBER FYBER. Doreen sent me the only ATC I had ever actually seen in person before making the 130 ATCs in Round One of CYBER FYBER trading. I couldn’t believe that there were so many people wanting one of my cards. I was really just a beginner. (Maggie) I know that it has been a bitter blow to you that CYBER FYBER 2 is not taking place, due to the economic crisis. Art, always a fragile area for funding, traditionally suffers badly in hard times. In the UK we are seeing all forms of adult education, particularly textiles, being eroded and it was partly this that prompted me to offer free online lessons with my last book. We have such a supportive textile family out there. What more do you think we can do to keep textiles afloat until things turn around - as I’m sure they will. We must all speak up. By that I mean, we each have a responsibility to inform those making community art decisions that textiles are important. Most museums have contribution boxes. 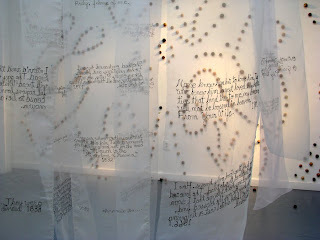 Drop a note inside asking for upcoming textile exhibitions. When browsing an art gallery website, write a message requesting textiles. When seeing textiles in public places, let the owner know how much it is appreciated. When we see other media in public places, we need to suggest the addition of textiles. We all need to be more vocal about fibre arts so that the wider arts world understands our strength. Speak up! (Maggie) Will you be looking to do it again when things improve - we need something to look forward to. I really hope that my vision for CYBER FYBER 2 finds a place outside my mind. I’m not one to fantasize or dream impossible scenarios. When thinking about concept, I’m really planning for the future. CYBER FYBER 2 is supposed to be real. Hopefully, it will be in 2011. (Maggie) And personally - what are your aims for the year ahead. I never really took the listing for CYBER FYBER 2 off the Gallery 80808/Vista Studio’s website. These are my two weeks to use the incredible gallery and I am going to use them. After all, I share in the responsibility to inform my local community about the need for and interest in textiles. So, I am going to mount my own solo exhibition. The working title is Everlasting. 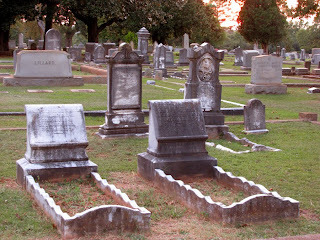 It will include the Grave Rubbing Quilts, which are already expanding into a larger installation. Recently, I made more rubbings on a trip to England. 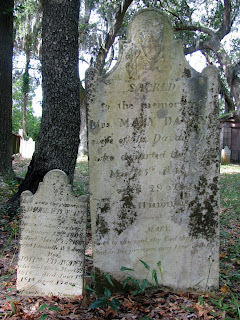 While there, I started collecting epitaphs. Several experiments with sheer polyester have resulted and are very promising. I’m reading books on cemeteries and have arranged a behind-the-scenes tour of a local funeral home. Steve and I have a trip to San Francisco planned so that I can visit Colma, California. It is known as the City of the Dead. 73% of the land is used for 17 different cemeteries. The show’s concept is still in an exploratory stage but I know that it involves a sense of personal and universal mortality. This probably has more to do with the fact that one of things happening this year is my fiftieth birthday. (Maggie) In a postscript to this article, Susan has just told us that she has received an exhibition contract from the Fine Art Center in Denton, Texas for a solo show. She says 'They've selected Blues Chapel. I'm thrilled for this opportunity that will happen from November through the first week of January 2010'. Maybe this is her silver lining as it would have been impossible for her to collect the artwork from Texas while manning CYBER FYBER 2! 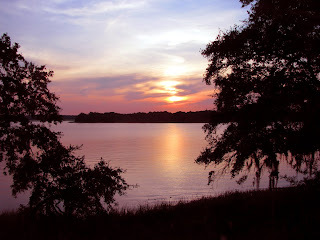 We actually went out for a fancy celebratory dinner at The Old Fort Pub....watching the sunset and dining by candlelight. The place was constructed near the ruins of the civil war era shore battery called Fort Mitchel. Before dinner we walked on the modern sidewalk to explore the vine covered moat, the cannon platforms, and area that had been home to union forces that never actually saw any military action. 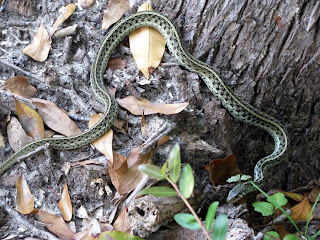 We, however, saw a snake. ...including these two for a mother who died in childbirth and the baby that followed her in death a month later. 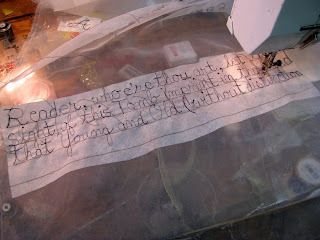 The epitaphs will be showing up as free motion stitching on sheer chiffon hangings soon. It's been a wonderful weekend. The sun shone on the vast beaches and I collected some shells. I've spent time stitching on another Grave Rubbing Quilt too. 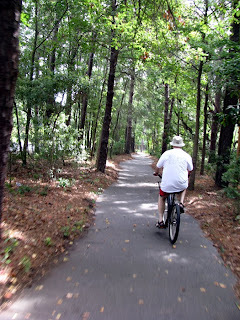 Below is a photo of Steve riding ahead of me on one of the great bike trails on the island. The rubbings on this piece came from Birmingham, UK; Hollywood Cemetery in Richmond, VA; Colma, California; and Wiscasset, Maine. 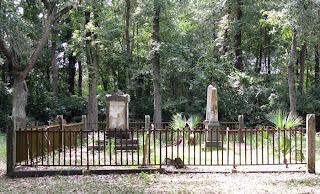 While working, I think about the various decades and locations from which these gravestones come. It is amazing; we are all connected....all over the world and throughout time...in our common passage from life. 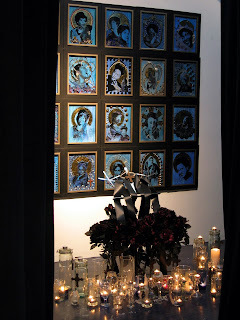 This series, like my epitaph installation and the Angels in Mourning Series, is really about life...how we spend our time on earth and what we leave behind to mark our existence. I'm not trying to focus on DEATH but on LIFE! After all, I turned fifty earlier this summer. I am acutely aware that I have more to create than I have time in which to do it. My art and my children are my legacy. The children are born, grown, and gone.....but the art is still being made and these pieces have a looming deadline: February 4 - 16, 2010 at Gallery 80808/Vista Studios is my show: Last Words and The Blues. "The Blues" is ready...and going to Denton, Texas from mid-November through the first week in January. 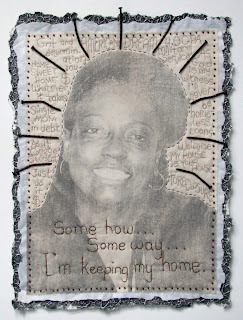 "Last Words" is all these grave rubbing quilt, the epitaph installation, and the angels. I've got an enormous amount of work to do in order to create the desired atmosphere....sacred and full of remembrance with a hint of suggestion for viewers to consider exactly how they might mark their own lives. 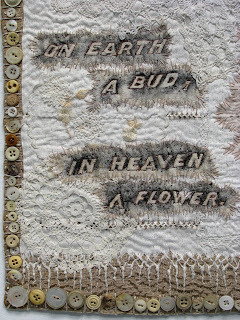 Quite a lot of this Grave Rubbing Quilt, On Earth a Bud, was stitched in the car last weekend but there was plenty left to do during the week....including the addition of small, artificial flowers. In order to make the entire installation less funereal, I want to have piles of artificial flowers....not any ordinary ones but ones from former cemetery arrangements. The cheery colors will add a touch of "life"....just the sort of "life" I'm looking for....artificial, symbolic, never dying, respectful, and a token of regret....but still quite colorful. 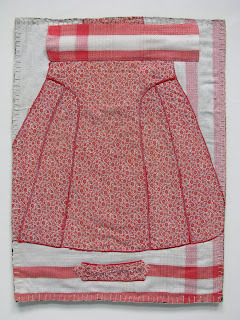 The back of the quilt is made from a vintage tablecloth and apron. Okay....so here's a little more information about the artificial flowers! I DO NOT UNDER ANY CIRCUMSTANCE REMOVE THEM FROM ANYWHERE NEAR A GRAVE! I dumpster dive. Artificial flowers in enormous, construction zone sized dumpsters are clearly discarded and headed to a landfill. These are the ones for me! I've taken to riding my moped at sunset through the local cemetery...which is about two blocks from the house. This is really just a slight detour on my regular ride home from my studio. There is exactly one trash can on the entire, extremely large grounds. Most of my flowers have come from it. I've been caught in the one big dumpster that is near the office, and the staff is afraid I'll get injured and sue. (As if anyone in their right mind would sue for such an obviously self-inflicted situation!) Yesterday, however, I found another construction-zoned sized dumpster at the very back of the property....out of the way....semi hidden by trees....with plenty of artificial flowers that I could reach without actually climbing into the container! I am so happy! 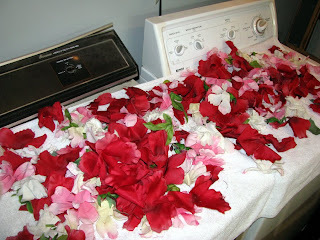 Of course, I dissect the blossoms and carefully wash all the colorful fabric. They lay to dry on our washer and dryer before being stored in new plastic garbage bags. Yesterday was quite productive....even more than the bonanza of artificial cemetery flowers. I spent the entire day in my studio designing Grave Rubbing Quilts. If I can get all twelve stitched before February, I'll be happy. Many are small....which I need for plane flights, train trips, and riding in the car. Next week I leave for Austria....an embroidery experience with Annica and my Swedish friends under the famous Sara Lechner. Now that I've got something to stitch while away, I'm guessing I'm ready. I leave packing for the very last moment! Last weekend presented a perfect time to see how my Epitaph Installation was progressing. The atrium at Gallery 80808/Vista Studios had a display of university ceramic student work but no one was manning the show on Sunday. Up on the tall ladder I went and the results were enlightening. First, I learned that I don't really need thirty more pieces. (Yippee!) Twenty will be more than enough. Second, I learned that there's a subtle, constant breeze from the air-conditioning units. Believe it or not, we still have to air condition the gallery and atrium during receptions held in the winter....so, next February the movement of the sheer chiffon will still take place. I really liked this fluctuating quality...so much so that I took a video of the pieces. It's only 49 seconds but shows the free motion stitching gently moving. I've gotten into a good rhythm for the stitching...which is making the progress fun and fast (or at least quicker than when I started!). Below is a photo of the adhesive backed/water soluble stabilizer I'm using. I've penciled lines one inch apart. 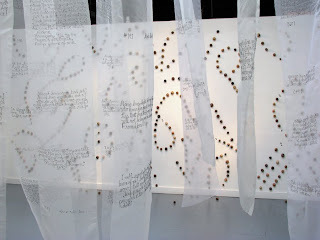 I snip the carrying threads (both sides) between words after each line has been free motion/written. I've got pages and pages of epitaphs....more than enough....though I can't help myself; I'm still collecting! 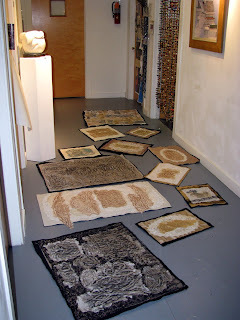 Surrounding this installation will be my Grave Rubbing Quilts but also a series of xylene photo transfers on paper. 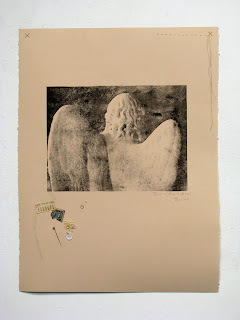 This new series is called Angels in Mourning. At first I really hated the name. Frankly, I couldn't believe that I was actually doing "angels". For me, this was about the same as doing fairies or dragons or using cheesy scrapbooking supplies or rubber stamps. The "snob" in me couldn't see this as "art"....which is ridiculous, of course! Honestly, I'm really impressed with lots of the work I see on-line created using these concepts and materials. The images are from the hundreds I've taken in cemeteries and other locations from Bath, England to Colma, California and beyond. Each was altered in Photoshop and printed as an over-sized, black-and-white photocopy before being transferred with xylene onto the paper. From the start I knew "more" was necessary....something to make the images "mine". I thought about adding paint (something I almost never do) or collaging words/epitaphs to the paper. My sister Wanda left a comment on one of my blog posts about a month ago. She mentioned "a connection with life." This phrase really hit a nerve. It was the perfect trigger to really get me thinking about these angels....between life and death....between past, present, and future....all the concepts I am trying to express through this work. 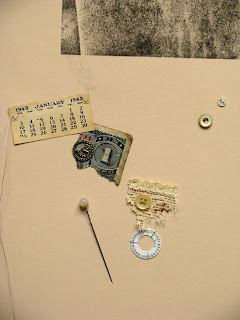 Wanda's words made me realize that what these pieces needed was the addition of personal tokens, trinkets, found objects, and especially my own HAND STITCHES. In fact, I'm mounting the work to 100% cotton rag, soft white mat board....not in the usual/professional picture framer fashion....but by cross stitching the upper corners directly through the piece and the mat board. The stack of transfers is pretty deep....so expect plenty more angels in upcoming posts....each one individually treated with stitch!